Custom closets are ideal solutions for anyone who has ever walked into their closet and felt as if they were in a storage room, a laundry room, and a linen closet all at once. 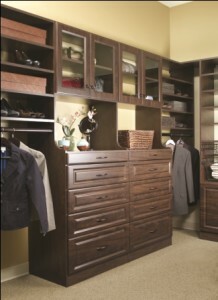 Heck, for most of us, closets do have to serve multiple functions, which is where More Space Place Naples comes in. By evaluating your unique organizational needs and taking detailed measurements of your space, we can offer you a variety of customized, adaptable solutions that will make your life a whole lot easier. The closet design consultants at our Naples showroom will create a visual rendering of your ideal closet so that you can see exactly how the finished product will look – no surprises, no stress. And all of our innovative custom closets are installed by professionally trained technicians, so once you create the closet of your dreams you can sit back, relax, and leave the rest of the work to us. To learn more about custom closets for Naples, Bonita Springs, Cape Coral, Naples Manor, Naples Park, and all of the surrounding areas, contact More Space Place today or stop by our showroom at 1720 Airport Road South in Naples. We’re proud to specialize in Murphy beds, wall beds, home office furniture, garage organization systems, and many more space-saving, modular room solutions.